Riley Piper's five goals is a new career high for the Unionville senior as the season gets underway. 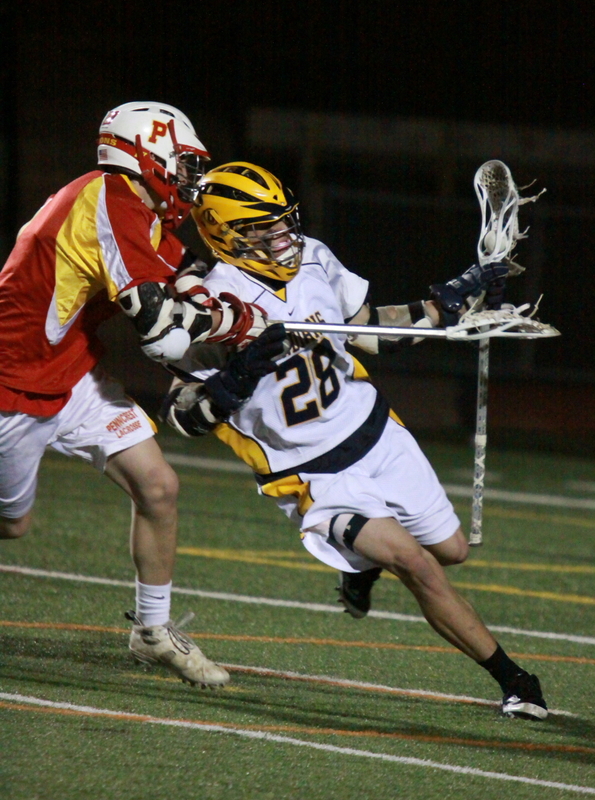 EAST MARLBOROUGH—Less than a week ago, it did not appear as though Unionville senior midfielder Riley Piper would have an opportunity to square off in what has become an annual non league match up with Penncrest in preparation for the upcoming Ches-Mont league season. Piper, who injured his shoulder in the first practice of the year, has been battling every day since, with the assistance of the Indians training staff rehabbing his damaged wing hoping to see action within the first few weeks of the regular season. 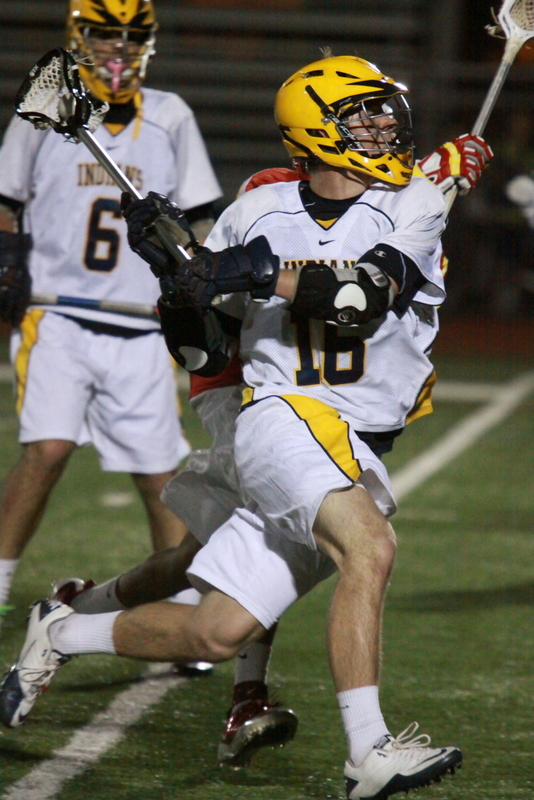 As the Lions, who have exchanged districts playoff wins with Unionville in three of the last four years, came to town Piper, who was cleared to play just a day prior, had never scored more than two goals in a single game in his career with the Indians. If they ever cast a remake of The Six Million Dollar Man, they may look to Piper as an inspiration for the screen play, as not only did he see playing time, but recorded his first career hat trick en route to a “break out game” scoring five goals, fueling the Indians offensive attack. After trailing 4-1, it was Piper who led Unionville come back effort as Piper (5goals, assist) posted back to back goals cutting the lead to 4-3 at the intermission. The second half was plagued by a disturbing pattern for the Unionville fans in attendance as the Indians managed to tie the game on four occasions during the third quarter, only to see the Lions regain the lead less than a minute after each Indians goal. 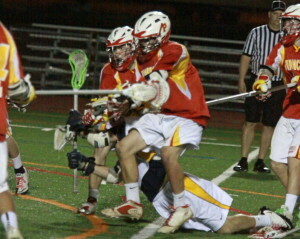 Following ESPN play of the week type goals by Max Kelly, who dove around the post fending off two Penncrest defenders to put it past the net minder, and senior David Apruzzese who scored from his knees as he was body checked by two Lions, the horn at the end of the third put a stop to the “we score, they score” pattern of Penncrest regaining the lead. 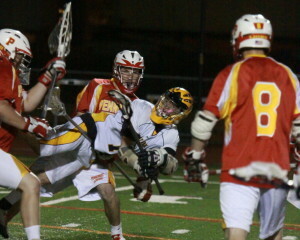 Yes, Indians senior David Apruzzese scored on this play as he was knocked to the ground by two Lions. Penncrest (2-0) score three consecutive goals in a three-minute span during the final frame to go up 10-7, and again it was Piper who stepped it up, posting a goal with 4:12 left in regulation to cut the lead to the eventual final 10-9. Indian notes: Riley Piper scored 5 goals on 15 shots, which is a 33.3% clip, while Unionville struggled inn the face off department winning just 6-of-22 in face offs. Austin Lowe and Quin Savant each snagged five ground balls for the Indians.